We had the most enjoyable morning discovering hidden Rome with Dino. His knowledge was outstanding and he made every part of it interesting and easy to digest. His enthusiasm, courtesy and smiling face, made this one of the best tours we've experienced. We would definitely use Dino again the next time we return to Rome! WOW! This may be the best tour we have ever taken anywhere! Dino was an outstanding guide through the beautiful city of Rome in the evening. He shared so much history and perspective. He took us to the exact spot for great photos ops and took an excellent photo of us at each one. I strongly recommend that you take this tour or one of Dino's other tours for a delightful experience in Rome! super knowledgeable, friendly, kept us fully entertained the whole time. Highly recommended! This was our third tour with Dino. It was really fantastic! Just as fun, well informed and super attentive to detail as the first two tours, consistent quality, we highly recommend him! Súper knowledgeable guide, very attentive to detail, very fun and informative, very highly recommend him! Underground Rome is a good choice, an original tour! And Dino is great guide. We got more than expected. We were travelling with two kids (14 and 11) and they liked this tour a lot. Vatican Deluxe tour: Dino is an amazing guide: professional, courteous, personable and extraordinarily knowledgeable about the tour subject matter. He provides as much or as little information as you'd like to hear about and asks/answers questions enthusiastically. He's flexible if there are crowds and circles back to popular items of interest so you can see it all. He knows where to be for the best views, scenery, photos, as well as how to efficiently navigate crowds. I highly recommend Dino. Dino is super interesting and an awesome tour guide. We loved every minute learning from his tremendous knowledge of ancient Rome. Dino kept all of us interested, wonderful for all ages! Borghese tour: Dino is an amazing guide! From the moment you meet him, he is professional, courteous, personable and extraordinarily knowledgeable about the tour subject matter. He provides as much or as little information as you'd like to hear about and asks/answers questions enthusiastically. He knows where to be for the best views, scenery, photos, as well as how to avoid crowds. I have already recommended him to friends and will book him again when I return to Italy. wow! Dino is a fantastic person and tour guide. He is a pleasure to listen to and be with as we toured the Vatican. I would highly recommend spending the day with Dino! +10! Dino is an incredible tour guide. He is extremely knowledgeable, very friendly, helpful and engaging. He has an infectious enthusiasm for history, he is a true expert and professional. Dino did an amazing job engaging my teenage son, who absolutely loved the tour. Dino was able to talk about history of Ancient Rome in a fun and easy to follow manner. The tour was the highlight of our Roman experience, and I am grateful to Dino for that. I will book more tours with Dino when back in Italy! Dino is the best! He was on time, respectful, did not rush us ever, and was full of interesting information. Kept our kids engaged the whole time, as well as us. Would definitely recommend again! Dino covered the Vatican and colosseum all in one 7-8 hour day thoroughly. Very knowledgeable and instantly answered questions without hesitation. This man knows his town, and has many interesting facts to add. Dino was engaging, enthusiastic, educated, and attentive. Our time with him was equalivent to a semester of history. We gained an appreciarion for the art and the history of the Vatican that we could not have received on a group tour. Dino was engaging, enthusiastic, educated, and attentive. Our time with him was equalivent to a semester of history. Dino was fabulous. His knowledge and commentary was really interesting. We took the additional option of including a driver with pickup and drop off at our hotel, well worth the extra money. Aquaduct park was a great inclusion in our tour. Thankyou for a memorable afternoon. See my review of his Ancient Rome tour. We are a family of 5 (3 teenagers), who visited Rome at the end of December 2018. We hired Dino for 2 half-days (Ancient Rome and Vatican) and 1 full day (Tivoli). He was always professional and knowledgeable. The Rome sites are pretty crowded (even during the winter when we went), and I would have felt somewhat lost without him. He guided us through the crowds and made the places come alive. Dino is an incredible guide. His love for his home city of Rome is infectious, and his knowledge of the city is vast: every archaeological site, historical location, monument, and basilica was accompanied by an expert-level explanation. He knows the best restaurants, the best views, the best shortcuts, the best places to take and pose for pictures, and every secret spot in the city. Book a tour with Dino - you will not regret a single moment. Dino was great. The day was very rainy but he adapted the tour and we made the best of it. The pictures and portrayals he shared on his ipad really helped to depict what Rome looked like during the height of the empire. He is very knowledgeable and an excellent guide ... we highly recommend him. Excellent-Dino has amazing knowledge. Really wonderful tour . I highly recommend him. Thanks Dino ! Four hour Vatican tour with Dino was fantastic. He was knowledgeable, entertaining and sensitive to our needs. He knew the best routes to move through the crowds to get the best views. He took the time to prep us the get the most if the visit to Sistine Chapel. Dino has an amazing "radio" voice. USE THIS GUIDE! Dino is a spectacular guide. We had a most enjoyable and pleasant day. Could not ask for a better day in the Roman country side. Everyone should have Dino as their guide! This was one of the best tours I have ever had. Dino is a great guide, very knowledgeable and intelligent. I have been in Rome many times, but thanks to Dino I have discovered hidden treasures of this eternal city. Highly recommended! Dino was extremely knowledgeable about the history, architecture and culture of Rome. He showed us some wonderful hidden treasures of Rome. Great tour. Dino was excellent. Strongly recommend! We toured the Vatican with Dino this morning. He is an excellent guide who shared many informative facts and fun anecdotes that made the tour very interesting for our party of four. This was money very well spent! Dino always took us to the location in each site where we would get the best experience and photos to keep as great memories. 5 out of 5 stars excellent and informative. Great personality. I would highly recommend him. We had only one full day for Rome and Dino helped us make the most of it. He arrived at hotel promptly and even before the taxi came, we were already learning. Dino's knowledge is phenomenal and the ability to skip lines let us see more than otherwise possible. Dino made it clear that it was out tour, so when we needed coffee and a quick lunch, he led us to several places to choose. By 4pm we were tired and completely satisfied. 5 stars for sure. Dino was a fantastic guide! We booked a full-day private tour of Vatican City and Rome. His responsiveness via messaging was excellent and well within a reasonable timeframe. We asked for a few modifications to see some specifics sites in Rome and he was very accommodating. During the tour, he explained everything in detail and ensured we had the best angles for our photos. Highly recommend touring with him if you want an in-depth description of the Vatican Museum. Dino is lovely, precise, efficient and very informative. Our group loved him and I very highly recommend him. Ite was fun to discover another aspect of Rome rather the one we know with Colosseum and the Vatican. Dino is the perfect guide . His knowledge of Rome is incredible and he's very professionnal in all aspect. We have spent time with Dino on 2 separate visits to Rome, and we are amazed at the depth of his knowledge-AND his ability to present it in a way that holds our interest. Based on the rainy weather, we decided with Dino that it might be better to make a substitution-walking on slippery ruins in Ostia was probably not a good idea. But Dino was able to easily substitute some fabulous churches and museums, and we had another wonderful day! We visited the Vatican previously, but this was our first visit with Dino, and we would definitely recommend him for this tour. His extensive knowledge and approachable presentation enhanced our visit, and helped us to appreciate the beautiful artwork and history. Visiting in the evening is highly recommended-not nearly as crowded as our previous daytime visit. Museums can be overwhelming, but Dino was able to point out the highlights-as well as some important works that we never would have noticed on our own. He organized our 3 hour tour so we maximized the available time, but never felt rushed. This was our second trip to Rome, and the second time we have selected Dino as our guide-and there are still many places to explore with him on our next trip. This was our second trip to Rome, and the second time we've worked with Dino- I think that should say it all! Anyone who says they have visited enough churches, has never gone with Dino. Two of the highlights were St. John Lateran and Basilica of the Holy Cross in Jerusalem-Santa Croce. There are not enough superlatives to describe Dino. I think the fact that we used him 3 years ago in Rome and scheduled with him again should say it all! The catacombs and St. Clement Basilica are sights not to miss, and Dino's explanations definitely enrich the experience without overwhelming you with data. The Vatican deluxe private tour was more than interesting with Dino as a guide. His knowledge the history is remarkable. Everything was made to accomodate us, party of six, and show us , even the little details, almost everything that has to be seen at The Vatican. It's money weel spent for that day. Dino has an extensive and expansive knowledge of his subject. We highly recommend Dino! Deep knowledge of papal and art history. Dino is extremely knowledgeable. This is our third tour of the Vatican and he is by far one he best. Dino was very informative and did a great job on our tour. Dino was fabulous. This is my third visit to the Vatican and I learned new things on this tour. I would highly recommend booking Dino! Dino was a fantastic guide. He was tireless and cared so deeply for the history that he bubbled over with enthusiasm. He came with a briefcase of supplental materials including an iPad with pictures that showed certain areas as historians think they were. We now have a great feel for the Forum and the Capitaline museum. Dino was fantastic! 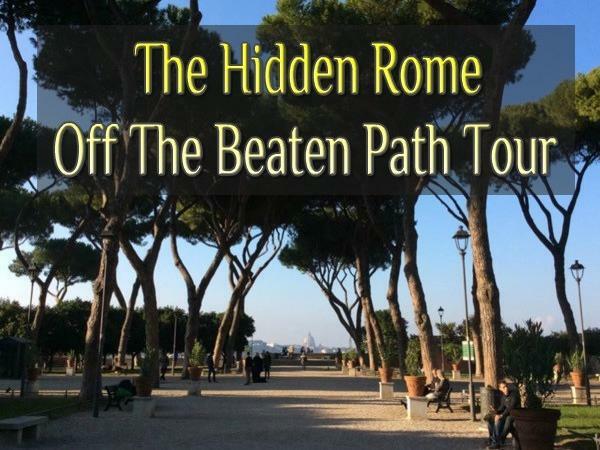 He met us at our front door on the Aventine Hill and guided us through the Aventine area, Circus Maximus, Palatine, Forum, Jewish Quarter and beyond. He was able to explain the significance of the area where we were staying with visits to the the Basilica S.S. Bonifacio e Alessio and the Basilica Santa Sabina. I would write much more but suffice it to say that our time in Rome was much grander with Dino's assistance early in the trip. I highly recommend Dino as a guide. Wonderful tour!! We had limited time in Rome & Dino was able to complete all of our tour requests. He is very professional & knows the ends & outs of Rome without wasting valueable time. Thanks again for a great day in Rome. Dino was wonderful in every way. He has an encyclopedic knowledge of everything Roman, both ancient & contemporary. He made sure we were comfortable at all times, could not have been more personable. We recommend him very highly. Again Dino was extremely professional and went out of his way to accommodate our family. We had a family member with limited mobility on this tour. Dino, got him a wheelchair to use at the Vatican museum to use through the tour then sat us at the Sistine Chapel and took the wheelchair back himself to allow us maximum time to enjoy the chapel. He is very knowledgeable and an excellent guide. This is our second time using his service and we will continue to ask for his help on our future Rome trips. Dino is fantastic. He is professional, courteous and very knowledgeable. This was our second trip engaging Dino's help and expertise and it was just as excellent as the first time. The tour was fantastic and covered the highlights of Ancient Rome without feeling rushed. We were all extremely satisfied. Thank Dino. Dino was one of the best guides we have ever had. He made the tour fun and had an extreme amount of knowledge of the subject. I had another tour of the Vatican years ago but this tour and guide was so much better and informative. He also loves his job and city and it shows in his tour. He also help us get back to the Metro and and made sure we were on the right station and train. When in Rome have Dino for a tour guide and you can't go wrong. Dino is very knowledgeable about the Vatican Museum and Sistine Chapel. Its a lot to cover in a tour, but he was able to adapt to focus on the areas on which we wanted to cover. He really likes to share his knowledge and was still enthusiastic on subjects he has probably covered many, many times. This tour was amazing! I absolutely loved Dino's tour. We really saw everything I wanted plus more. Dino was very nice, friendly and made sure everyone crossed the street safely. This could be somewhat of a challenge in Italy. He was very knowledgeable and had some surprises to really give you a good visualization of what you're looking at. Book this tour with Dino you will not regret it. From the moment we started to the moment we finished, Dino was the consummate professional. He arrived early, provided information on the area we were staying in, and gave an amazingly interesting tour. He is great with families, keep things on schedule, and was always pointing out the interesting facts that kept all of us entertained and informed. Would go again! Dino was great! He was very in tune to what my family needed at the time of this tour - my boys are 13/16 and were over touring, but Dino kept it short and sweet - he kept the tour moving. We spent most of our time at the Colosseum which is what we wanted to do :) this was a great tour for us and we thank you Dino! We had an amazing tour of Rome underground with Dino. His command of history is amazing , he showed us one of the most beautiful houses and temples from 1700-1800 years and last stop at Capuccin Church was very sobering and unique. He was amazing with our kids and help us understand with his pictorials of how all theses places looked like originally. Highly recommend Dino . Dino was prompt and deliberate in every aspect of this tour. He prepared for our comfort and well-being. The pace was easy yet utterly comprehensive as every aspect of the neighborhoods were illuminated: cultural trends, ancient structures, bridges, murals, gardens. Dino arranged a church visit to the significant Santa Maria recalling I'd hoped to light a memorial candle for a friend. Trastevere's diverse history relative to Rome's evolution came alive for us. He even planned for our walk back home. I'm sure I don't have the words that would adequately honor the experience my daughter and I had on Dino's tours. His encyclopedic knowledge of all things historical and contemporary in his beautiful Rome and the reverence he imparted for Vatican City was rivaled only by the love and passion through which he shared his itineraries. Well paced, yet dense. He suffused his narrations with documents and maps. EVERY moment with Dino was used to explore: artifacts, walls, floors, chambers, gardens, structures. Dino was a wealth of knowledge. We enjoyed our tour. It is obvious he has a passion for history. If you are in Rome, especially for the first time, you could not do anything better than to get a tour with Dino. We were there for 10 days and, by far, the highlight of our trip was the day and a half that we spent with Dino. He made it easy, educational, and most important, fun. He handled everything from the tickets to getting us across the street in an extremely fun and professional manner. We went to Florence for a day afterwards and all we could talk about was that we wished Dino was there. My family really enjoyed the tour and found that Dino was extremely accommodating in regards to our needs. He and the driver went out of their way to add sites in Rome which we had yet to see. The lunch was perfect. Would strongly recommend Dino. We couldn't have chosen a better tour guide than Dino. His knowledge is unsurpassed. He was prompt, pleasant, patient and well prepared. If considering a tour in Rome, book Dino early. Dino made our trip to Rome perfect one. He brought visuals to help us understand better. He is so personable. He kept everyone entertained including us and my 14 and 9 year old. If I come back to Rome again, I would definitely do another tour with him. Dino and our driver made this an incredible evening tour with facts, history, local information and lots of clear passion for the City of Rome and it's rich history. All of us enjoyed it very much and it will be a memorable and recommended part of our trip. Thank you!! This was our third tour with Dino. You can't say enough about how good he is and his passion for the city of Rome with 500 characters. If you go to Rome and want to learn and love about the city there is no better way than going with Dino. Our kids (13,14,15) loved the tours we did with Dino. Great communication before the tour, punctual start, highly knowledgeable and gave thoughtful answers to all our questions. We recommend Dino warmly for this tour. Absolutely enjoyed the archaeological history behind each location. My boys of 18, 20, and 21 were engaged throughout the tour and also enjoyed the rich history of these places. I highly recommend taking this tour for anyone fascinated by archaeological history. Even if the tour is underground, there is still a fair amount of walking between locations, so prepare to bring lots of water especially if taking the tour in summer months. This tour was by far our favorite part of our trip to Rome! Dino was incredibly personable and knowledgeable about every aspect of our trip. He and our driver, Andre, were at our hotel promptly at 9:15 and he had put thought into which sights would be best to see right at sunset. He was flexible and willing to show us an additional spot that we showed interest in... To top it all off, he was great at photography and took many great pictures of us to remember this wonderful tour and vacation! Fantastic Tour! Our kids were celebrating their honeymoon. This was their second tour with Dino. Beautiful, Romantic and unique tour. Castelli Romani has a lot to offer. Dino was the perfect Guide to share the history, food and wine of this region. Highly recommend this tour if you want to get away from Rome for a day. Dino is full of information and loved to share his knowledge. Friendly, polite. Great sense of humor. The best of the best! Dino is the Best! Our kids were celebrating their honeymoon in Italy. Dino is such a knowledgeable guide. So much information, engaging and friendly at the same time. This is a Must tour if you want a special, unique experience of The Vatican!!! My son and I both enjoyed this tour very much. Our tour guide Dino was fantastic. I appreciated the time he took to interact with my son and tailor the tour to our interests. Dino was AMAZING- great historian, very kind and attentive and you could tell was truly excited about what he was talking about. We loved having him as our guide for the Vatican. Great tour! Dino did an amazing job and made our whole experience wonderful! Thank you Dino! Dino is incredibly knowledgeable, entertaining and professional. We thoroughly enjoyed our tour with him. I would have given more stars if at all possible. Dino is fantastic, I actually cannot wait to go back to Rome to contact him again for another tour. He is super knowledgeable, professional and very pleasant. 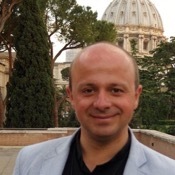 We would totally recommend to contact him if you want to have an informative tour which is also filled with little, interesting details about the splendid Vatican Museums and the Sistine Chapel. Dino guided our tour of Rome today! We were impressed by the wide variety of instructional materials he used such as pictures, charts and his tablet! We have taken many tours but this was the best as far as information given, timing and the way he moved us through a lot of attractions without hurrying! It was perfect! We highly recommend him. This was our second tour with Dino on this trip, and it was perhaps even more amazing than the first. He is so incredibly knowledgeable, professional, and good at sharing his knowledge with visitors. I can't imagine visiting these locations without this kind of expert guide. Dino was the most amazing tour guide EVER! Incredibly knowledgeable, prompt, courteous, patient with our many questions (he actually seemed to enjoy our curiosity. I cannot recommend him highly enough! Wonderful tour with Dino! We went on the underground tour. Dino even customized it for us! One of the best guides we ever had! Learned a great deal and had fun...If I go back, we will be calling Dino for sure. I think this is a great website and highly recommend to anyone who wants a high quality tour. This was the best tour on our entire European trip. Dino was fantastic, knowledgeable about the area, history and was able to navigate us around the colosseum and Vatican with ease. My husband is handicapped and he was still able to enjoy the colosseum with Dino's help. Unfortunately the Vatican has stairs which didn't work for my husband but Dino arranged for a cab to take him back to the hotel. He was so accommodating and maneuvered us through the vast complex with ease. I'd give him 10 stars!! Our tour of Rome was great and Dino was a wonderful guide. He was extremely organized, knowledgeable and very personable. We only had one day in Rome while we were in port with our cruise ship and we were able to see so much of the city thanks to Dino!